Hey, I’m Erik, Make Tech Better, Incorporated. You’re looking to design a website for your new small business, and the question I get asked a lot is, “Hey! Have you ever made a website for my business in particular?”, so whether it’s a dentist or a lawyer or what have you, and that’s a really good question. But the thing is, do you want to look like every other lawyer or dentist? Or do you want to stand out from the crowd? I think the best thing to do is to look at what are your goals, who are you trying to attract, and then design something that’s really original, unique to you and your industry, and really make sure you stand out from the crowd. I want to make sure that you look at unique as you possibly can. I like to do that for myself, and I also like to do that for all my clients. Hey, speaking of which, I forgot to mention something super important. I’ve got an offer for you. Have I got a deal for you! Oy! You’ll find a link to it below. 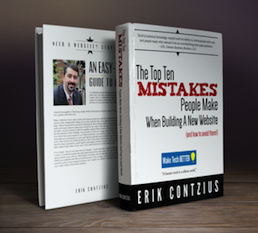 It’s called The Top Ten Mistakes People Make When Building a Website and How to Avoid Them. I wrote it myself. You can get it for free. Again, click below and follow the instructions. It’ll get emailed directly to you. Once again, I’m Erik from Make Tech Better: A Human Touch in a Silicon World. Subscribe to our Make Tech Better Newsletter today and receive "The Top 10 Mistakes People Make When Building A Website (and how to avoid them!)" absolutely free!